Corey & Stacy Johnson laden zum Verweilen ein und erleben Sie dieses 1-Zimmer-Hütte nur wenige Schritte vom Lake Michigan! Es hat auch genügend Privatsphäre für einen großen Familienausflug oder Optionen für mehrere Ferienhäuser mit einer größeren Gruppe zu mieten. Die Haustür ist 350 Meter entfernt von der Klippe und dann nur 40 Stufen hinunter zu einem privaten Strand! My wife and two daughters loved this property. There are a total of six cabins on the property. The cabin we stayed in #2) was the furthest from the water, but it was a very short walk down the driveway to the beach. This cabin is tucked back in the woods, which afforded us lots of privacy. It was very clean and updated, and our hosts were very accommodating. Highly recommend for a peaceful and relaxing Lake Michigan retreat. Great cottage #2 - just the right size for two. Newer unit; all knotty pine. Quiet and peaceful! I loved my stay at this Sunset Beach cottage. 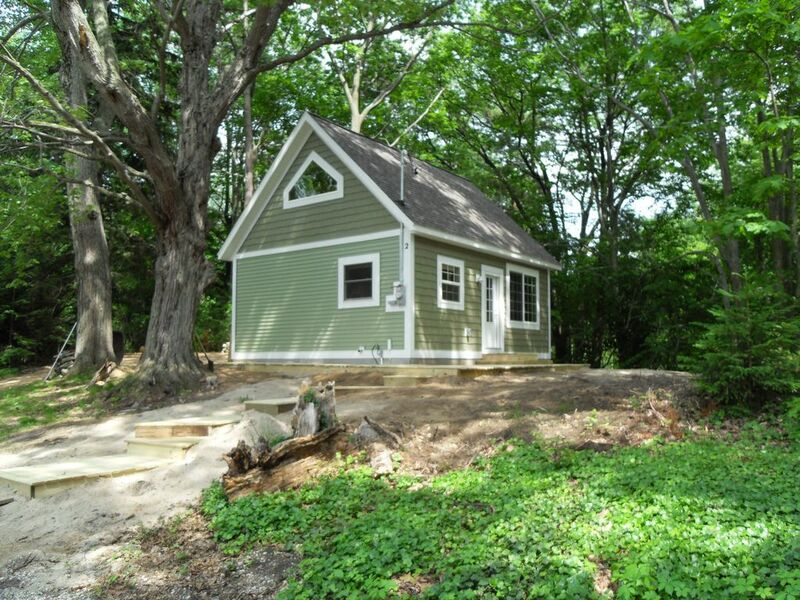 The cottage is adorable and private. The beach was just a short walk down the drive and was VERY private. Awesome sunsets there. The cottage has a full kitchen with plenty of dishes. There were no pans so you may want to bring those. The bed was very comfy and everything was VERY clean. I loved it!! Corey is a wonderful host and very helpful. I thought this cottage would have been closer to the water but that turned out to be OK due to the weather ... the owners are especially friendly and helpful and i would not hesitate renting from them again. they also have other cottages in different sizes closer to the water that look very nice and are as well maintained as this newer unit is. our next visit would most likely be in one of those lake facing units. Sunset beach is a very nice collection of properties. My wife and I had a great time and Corey was very helpful with the few questions we had. The cottage we stayed in (#2), was really nice/modern. It was further from the water/bluff than we had thought but that didn't negatively affect our stay. We would definitely return to Sunset Beach and would recommend to family and friends. We had no kids for a weekend away! Very relaxing and nice. Had a great time! NOTE: Linens and Towels are NOT provided. CLEANING FEE of $100 is REFUNDABLE if the cottage is cleaned prior to departure (cleaning supplies are provided). A refund check of $100 will be provided upon checkout. We look forward to your visit!